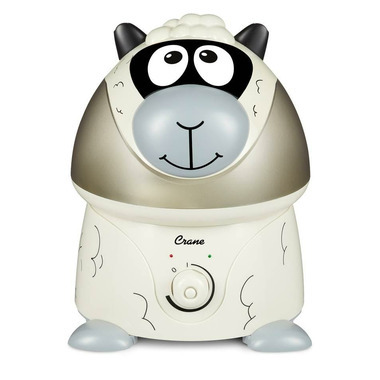 Crane Cool Mist Adorable Sheep Humidifier features a 1 gallon (3.78 L) ultrasonic humidifier can produce up to 2.1 gallons (8 L) of moisture a day . This moisture can help relieve your child's nasal congestion, dry cough, and sinus irritation, so they can breathe easier for a good night's sleep. We got this for our 10 month old during the dry winter months. It's cute and quiet. It needs filling frequently but needs to be rinsed and cleaned anyway. The lights are bright on it(green for on and red when it's out of water) so in the dark it's lighting up the whole room, but we covered them with fabric tape and you can't see them now. We are happy with it so far!